Hi! Thanks so much for stopping by! I appreciate you taking the time to learn more about my 2019 fundraiser for The Eclectic Mill. As many of you know, I have a passion for the arts and our environment. 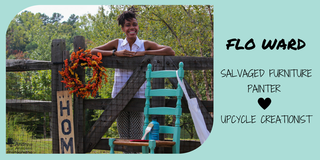 It is fueled by my business, We Chic’d It!, where we refinish, refurbish, reupholster, and repurpose home furnishings for/with our clients. What you may not know is that for years, we’ve been asked about sharing our space and making it into a co-working space for creatives as well as for those looking for full-time employment. So after looking at our current lease agreement, seeing what’s offered locally, and dealing with the local shipping container ordinances, we realize that it would be the perfect time to move forward with purchasing our warehouse with land to create a co-working space for creatives, and using our shipping containers for some of those additions. I know that others within our community are looking for this type of solution and I'm excited about being able to bring this to our area. To bring a cooperative creative space to Eastern Lincoln County, NC that will allow for creatives to collaborate with others, showcase their crafts, have a separate space to create their crafts, educate the youth with low cost/free after-school programs and field-trips, and encourage creativity for all. Let’s get this started!!!!! We will need a minimum of $10,000 for the following items, to have this space open and available to our community by June 1st, just in time for summer. To begin teaching content specific classes to the community within our Coop as well as within our local high schools. Become certified as an educational establishment that offers secondary trade school opportunities for our community. Thank you sooooo very much for your support! No donation is too small. It all goes to a good cause! If you have any questions, suggestions, or want to collaborate, don't hesitate to contact us! THANKS!!!!! Share Your Ideas/Questions with Us!